Place frozen chicken breasts in dish. Next spoon pesto over the top of each breast. Place entire bag of chicken with marinade in 9x13 dish. Bake at 350 for 45 minutes covered. Line baking pan with buns. Remove tops of buns and set aside. 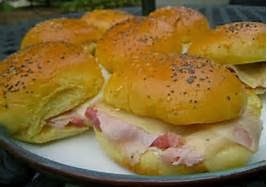 Layer ham evenly on all buns. Layer cheese evenly on all buns. Place tops of buns onto the sandwiches. In small bowl, mix butter, mustard, Worcestershire sauce, poppy seeds and onion. Pour mustard mixture evenly over buns. Serving Day: Preheat oven to 350. Place in oven directly from freezer. Bake covered for 40 minutes. Uncover. Bake another 5 minutes. Meanwhile, brown meat in large skillet; drain. Stir in marinara sauce; simmer on medium heat 2 min. Remove from heat. Drain pasta. Mix cooking crème, basil and Parmesan in large bowl; stir in pasta. 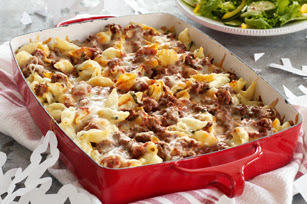 Spread half the meat sauce onto bottom of 13x9-inch baking dish sprayed with cooking spray; cover with layers of pasta mixture and remaining meat sauce. Sprinkle with mozzarella; cover with foil. Refrigerate up to 24 hours or freeze for later. Thaw, Heat oven to 375ºF. Bake casserole, covered, 40 to 45 min. or until heated through, uncovering after 30 min. Place oil in skillet and brown beef on all sides. Place beef in crockpot. Add remaining ingredients and enough water to barely cover roast. Cover. Cook on low 10-12 hours until beef is tender. Remove and shred, using 2 forks to pull apart. Discard fatty pieces. Return meat to crockpot and stir to combine meat and liquid. Cool completely. Skim solid grease off the top and discard. Pour into Ziploc quart-size freezer bag. Freeze enough rice for 6 servings in Ziploc sandwich bag. Place both small bags in a gallon-size Ziploc bag. Freeze flat. In gallon freezer bag, dump in all of the ingredients EXCEPT macaroni noodles. Freeze. Thaw freezer bag in fridge. Pour into greased 9x13: stir in uncooked macaroni noodles and stir until all ingredients combined. Cover and return to fridge for 9-13 hours. Bake, uncovered, at 350 for 1 hour.